It was a longgg wait , Waiting for 45 minutes outside the door of the hall, of people screaming, the time headlines will be ‘ Usha Uthup Live, and the audience dead”, everyone laughing, peopel tired of waiting. Then doing some time pass withs ecurity guards, to open teh door , and atleats allow some ac hawa outside ;-). As teh door opened a little bit, I shouted –”someone fainted , here opene the door , this hulchal going on as Usha Uthup did her technical sound check in side the hall. The serpentine queue just grew by every second, jostling each other and asking volunteers how much more time ? how much more time ?. Bachi Karkaria came out, we all screamed how much more time , ten minutes she said and we all started chanting the ten minutes , our patience running out…. bhaag hi gayi…… and …. Finally, door opened I ran to take the best place right in front, as I had to take a few videos and see and hear her clear as crystal. Usha Uthup remembering, R D Burman she said, she was potted by by him in 1969 at gazebo and at that time she did not know , who R D Burman, later they became great friends. R D Burman wrote a song her exclusively,buts sadly she could nto sing the song, for various reasons, but was penned for her. The song was.. ‘ Duniya main logon ko…………….. monica oh my darling…. in the begining of song there is yoddleling.. two types. Usha she called out to me from stage to yoodle with her, that was a golden moment freezed the audience were divdied into right and left and she gave us two types of yoddling for her songs..
As I I am a big mouth, with a karari avaaz, needless to say I was and still am loudest in my group and Usha Uthup said from stage. Hey you in red, come up… and yoddle , and I was like what ? who me ?/ yes you ??? and there iI went jumping up da stage ;-). Another girl from other side was called too . One was low paparaapapa/…..one was high…parrappara…. cam ein my lap, and I think i did do justice for my group, and got the shabashi FROM her, when she said in her signature style ‘ super amma “, and then started all masti magic of usha Uthup. 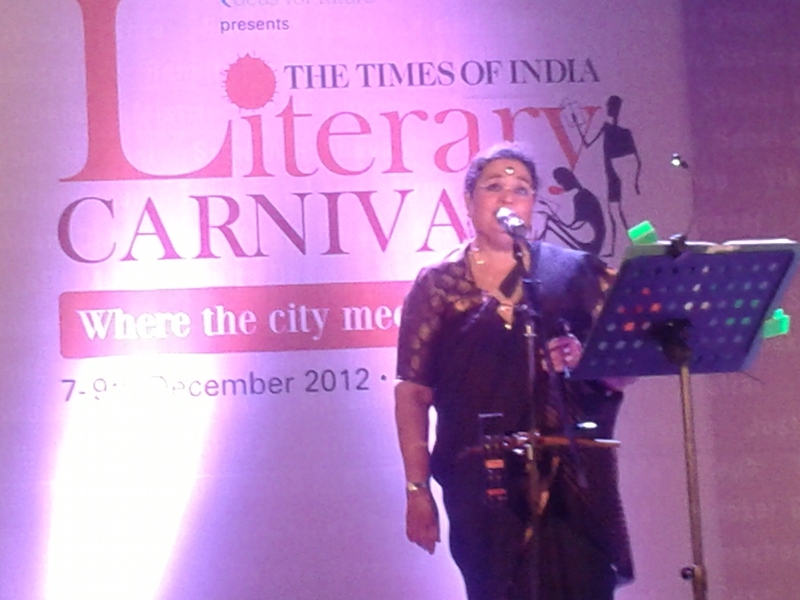 Did you know that Usha Uthup wears Sports shoes with kanjeevaram embroidery ? Rearading her trademark S aree, she shared that many people earlier thought that it was my publicity stunt a marketing strategy, and Sshe said , ‘ I was born in a middle class family where all women wore sarees, clap clap went the sudience, and hey do you see how i I show my pallu ??? , she said getting pallu ahead in style , which covered her each inch of body and she said , ‘ Obviously , I dont want cameraman to catch my belly tyres…. hahahahahah went on the crowd . We all danced to darling………………….. and bom bombay bombay meri hai !! !